It’s no secret that I’ve been a fan of Paint Shop Pro for a long time, and I’ve been waiting for the X3 version with mixed feelings. On one hand, I’m always excited to see what new tools and features will be introduced along with what additional creative content will be included. On the other hand, I’m always a little worried that a new release may make changes to some aspect of the application that I love, and I’ll have to go through a sort of mourning period until I get used to the changes and learn to live with them. When I first saw how many changes and enhancements were made in PaintShop Photo Pro X3, these mixed feelings persisted for a bit because this release truly is a major upgrade. However, after spending some time with the software, I am more than just a little impressed. Version X3 of the software may be a huge overhaul, but it still has all the old functionality I know and love – along with some great additions that improve on both the technical and creative aspects of the application. With the release of version X3, there has been a minor change to the name of the application. Instead of being called Paint Shop Pro Photo, the software’s official name is now PaintShop Photo Pro. However, since old habits die hard, I’ll probably still refer to the software as Paint Shop Pro. One of the most obvious additions to PaintShop Photo Pro X3 is the new, integrated Organizer that helps you manage and catalog your photos. A screenshot of the Organizer is shown to the left. (Click any image for a larger view.) This is an extremely welcome addition since not only does the Organizer serve as a photo viewer and management system, but it also provides a central starting point for photo editing projects. Double-clicking an image in the organizer will open it in the main editor, where you can make any modifications or adjustments to the image. Alternatively, you can select the photo and then click either the Express Lab or Full Editor button, depending on what type of adjustments you want to make. Paint Shop Pro veterans should feel right at home in the Full Editor – at first glance, the user interface is almost identical to that of version X2. All of the tools and brushes are right where you’d expect them to be, and you can use the same steps you followed to perform editing tasks in previous versions of the software. If you’re new to Paint Shop Pro, you should still be able to jump right in and handle basic photo editing jobs. All of the tutorials, the Learning Center, and the integrated help system from X2 are still present along with a new means of assistance – the Corel Guide. You can access the Corel Guide by clicking on the orange icon in the upper right corner of the application. Here, you can find additional editing tips, gain access to new creative content as it becomes available, and check for software updates. A new RAW lab for the non-destructive editing and processing of RAW photos. The ability to copy the editing tasks that have been performed on one photo and apply them to another. For more details on this feature, see Copying Edits to Multiple Photos in PaintShop Photo Pro X3. An enhanced Express Lab with additional tools, such as local tone mapping. A new Object Extractor that lets you cut out objects from digital photos. 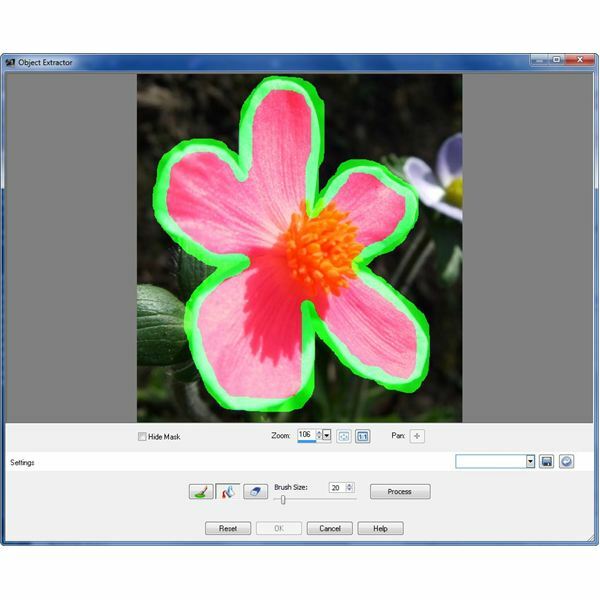 A Smart Carver tool that makes it easy to remove unwanted objects from a digital photo or alter the size of an object in a photo without distorting the background. The inclusion of a Project Creator that lets you create calendars, greeting cards, and other personalized projects with your digital photos. Enhanced performance that takes advantage of multi-core processing. On-image text editing that makes it easier to add and edit text. I’ll look at few of these features a little more in-depth on the next page. One of the most common "advanced" tasks that enthusiasts want in a photo editor is the ability to cut an object out of a digital photo in order to get rid of the background or place that object in another image. To help with that task, Paint Shop Pro Photo X2 Ultimate included a background remover plug-in that did a pretty decent job most of the time. PaintShop Photo Pro X3 has gone a step further with a built-in Object Extractor that is extremely easy to use (even easier than the background remover plug-in) and gives some very nice results. All you have to do is draw an outline around the object that you want to extract, select the area you want to keep (inside or outside the outline), and process. 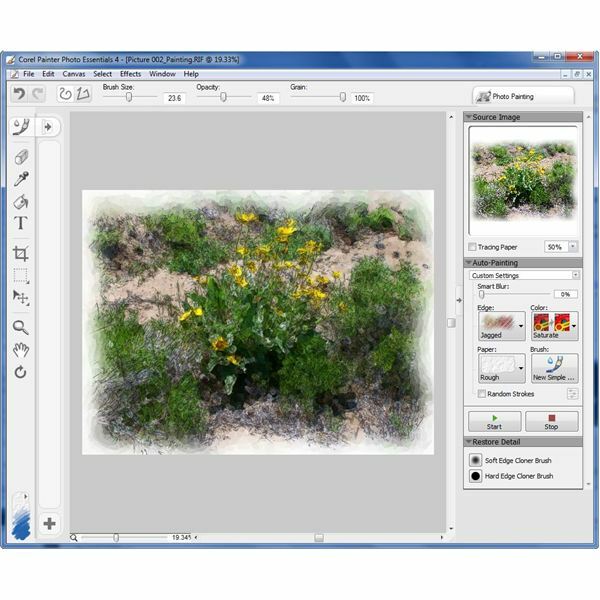 To learn more about how this tool works, see Using PaintShop Photo Pro X3’s Object Extractor. Adding text to digital photos could be a bit cumbersome in prior versions of Paint Shop Pro. With PaintShop Photo Pro X3, you can add text directly to a photo without having to type it out first in a floating text box. When this text is added, a new vector layer is created so you can easily edit the text and move it around the image after placing it on the photo. The entire process is much more intuitive than it was in previous releases of the software and quite a bit more functional as well. The Smart Carver is one of the more versatile new tools in PaintShop Photo Pro X3. A primary function of the tool is the ability to paint over any unwanted items in a digital photo and remove them while leaving the rest of the photo intact. While it can take some practice to get the best results out of the Smart Carver and you may have to follow its use with some touch-up work, it’s definitely a quick and easy way to get started with the object removal process. The Smart Carver can also be used to change aspect ratios in a digital photo without distorting the objects in an image. For example, if you want to take an 8" x 10" photo and transform it into a 5" x 5" square without cropping, you can use the Smart Carver to mark the items in the photo that you want to keep and then let the tool "smartly" adjust the photo’s size. For more details, see PaintShop Photo Pro X3’s Smart Carver Tool. The Project Creator is a supplemental application that comes bundled with PaintShop Photo Pro X3. With this utility, you can create calendars, slide shows, greeting cards, and other projects showcasing your digital photos. You can also use the tool to share photos and videos at online sites such as Facebook, Flickr, and YouTube. Once you’ve created your project, you can either print it on your home printer, send or share the resulting file, or use the Order Online feature to order a professionally printed version of your creation. The PaintShop Photo Pro X3 bundle also includes a copy of Corel Painter Photo Essentials 4. This is a fun little application that lets you create images that resemble paintings from a digital photograph. The software has a number of built-in presets that mimic different painting styles, and you can also select your own settings to achieve a customized look. 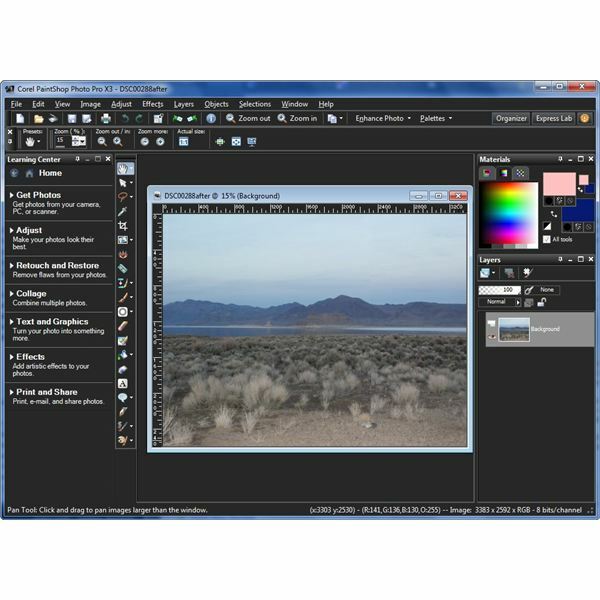 Painter Photo Essentials 4 is very easy to use. All you have to do is open a digital photo, choose one of the various styles, and click Start to begin. You can wait for the process to run its full course or click the Stop button at any time if you’re happy with the results seen on your screen. Corel PaintShop Photo Pro X3 retails for $99.99 for the full version, and the upgrade version runs $79.99. A significant savings can be had if you purchase the bundle that contains both PaintShop Photo Pro X3 and VideoStudio Pro X3. While both products list for $99.99 each separately, the bundled package costs $149.99. 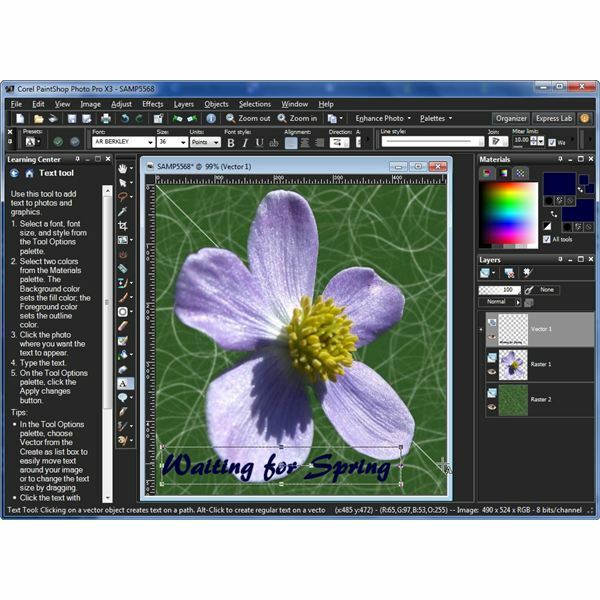 When you consider all of the substantial additions and enhancements, Corel PaintShop Photo Pro X3 is an excellent deal for both new users and those considering an upgrade from a prior version. Although I was quite happy with X2 Ultimate, the new tools in X3 do add quite a bit of functionality and the inclusion of an integrated Organizer is a definite boon. Paint Shop Pro is still my favorite photo editor, and now, I like it even more than I did before.